VPLEX Virtual edition provides all the innovation and top of the class features and technology that are present in the physical counterpart. I want to summarize a little what VPLEX is in general, and what it can do for your system, and then I will get into the unique characteristics of the virtual edition. VPLEX is an inline appliance that will provide for you continuous availability, and data mobility. 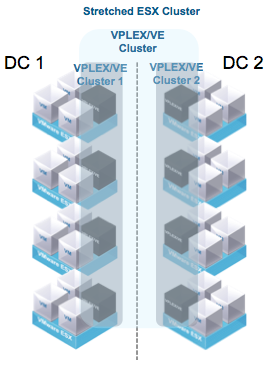 You can go from 5 to 7 9’s when you add VPLEX to your system in combination with a stretched cluster. In the spectrum of data protection systems/appliances/software, VPLEX covers the continuous availability with zero downtime. On the right side you will find your backup software and media, in the middle you will find Recoverpoint and replication technologies, and then if you can’t afford disruption, or if you are thinking about a delicate data migration project, you will find VPLEX on the far left. VPLEX is a true active-active, read/write from two sites via a virtual distributed volume, storage virtualization platform. For example, in the diagram above, think of Site A and Site B like two physical implementations, it could be in the same datacenter on different racks, or it could be on across the street or town , no more than 100km apart or with less than 10ms of Round Trip Time (RTT) latency between them. The result of this configuration in case of a disaster, one failed site, is to be able to have an HA event because the data is in both sites simultaneously. We could also apply DRS for instantaneous load balancing across sites, because the distributed mirrored volumed has all the data on both sites. Then what is so special about the virtual edition? Well, VPLEX virtual edition is available as a vApp for VMware. 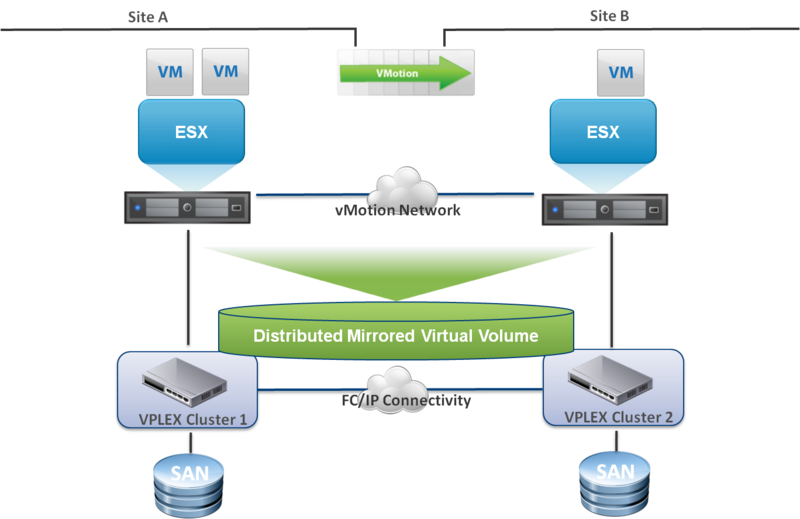 Using you existing cluster you can have distributed virtual volumes across two sites using (at GA) VNXe3200 iSCSI volumes. The VPLEX/VE consists of four vDirectors and one management VM. The vDirectors will reside on a different ESXi host each, with affinity. The management VM can co-reside in a host with any of the vDirectors. The minimum requirements for each vDirectors is 6 vCPU’s and 16 GB of RAM, along with 5 NICS on each hosts for the front end and back end connections. Standard VMware best practices, like the use of distributed virtual switches, apply. VPLEX/VE leverages your current VMware environment, is managed and monitored using you vCenter and the data protection is a per VM basis, so is the licensing model. It is customer installable, fast and easy to deploy. VPLEX/VE is recommended to mid market Tier 1 and Tier 2 applications, and for Tier 2 enterprise applications, something in the order of 80k IOPS. It achieves continuous availability, provides data mobility between locations and dynamic VM load balancing.